Kate saw a recipe on Pinterest she wanted to try for dinner tonight. I've used the image from the original post. This isn't a detox dish and includes some ingredients on our 'not allowed' list, so I improvised. 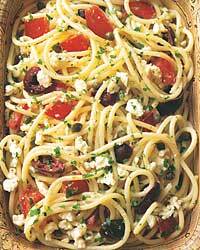 The main ingredient of the dish is feta cheese, which is not allowed, so I simply did without. I was toying with the idea of using the soya cheese in the fridge. This was Kate's suggestion when she first mentioned it, but when I saw all the lovely ingredients in front of me ready to prep I decided against it, I just couldn't seeing t fitting in. The original has capers, but Kate doesn't like them, so these were left out also. And it's supposed to have flat leaf parsley, but we didn't have any in stock, so I used basil. Finally, we used Free From pasta twists, instead of regular spaghetti. It tasted good. Yes, just good. On this occasion I would've liked the feta cheese. I think I over did the garlic as well, 3 cloves was 1 too many. Still, a very healthy meal which filled us up after a long day.